Most of Japan was brought to a standstill as Typhoon Phanfone lashed the country, resulting in high waves, heavy rains and disruption of power lines and flights on Sunday. According to BBC, three US airmen, who the police claim were taking photographs of the sea in Okinawa, were washed away in the storm. One of them has been confirmed dead, while the other two remain missing. Okinawa is home to about half of the 50,000 US troops stationed in Japan, The Guardian reports. The typhoon made landfall on Monday morning near the central city of Hamamatsu, with winds of up to 180 kilometre per hour. Phanfone, which was downgraded from an earlier status of a super typhoon, headed towards the Pacific Ocean after battering Tokyo, the capital city. The storm is believed to lose power as it moves further into the ocean, but the Japan Meteorological Agency has warned that it might still be dangerous. 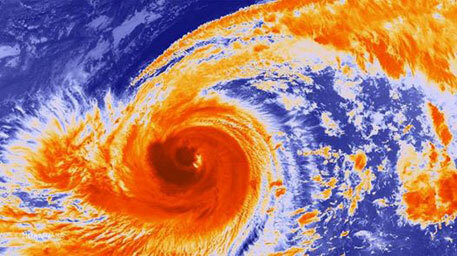 According to the weather agency, Japan witnesses 11 typhoons in a year on an average. Normal life came to a halt at the start of the week. Many schools were closed on Monday and service of the Shinkansen bullet train was suspended, leaving passengers stranded. Two major car companies—Honda and Nissan—were forced to halt production at their plants. Toyota halted production in 12 of its plants. At least 600 domestic flights were cancelled, reports Reuters. Heavy rains also delayed the Japanese Formula One Grand Prix on Sunday. A French driver was injured after losing control of his race car in the wet conditions. Heavy rains forced the cancellation of search operations for the victims of Mount Ontake, a popular tourist destination in central Japan. The volcano erupted without warning on September 27, killing more than 50 people. At least 12 people from the group of hikers are still missing, Reuters reports. Fearing mudslides from the ash-covered volcano following heavy rains from the storm, authorities evacuated a score of households at the foothills of the peak. Close to 200,000 households, including 20,000 in Tokyo, were also asked to evacuate fearing floods and landslides.